Food is one of those things we simply cannot live without—as fundamental to survival as oxygen and a heartbeat. That makes eating a universal phenomenon, whether it’s pancakes and maple syrup in Canada or fried ants in the Amazon. Before I even set foot in Colombia, I sensed it was a country of magnificent diversity, both culturally and geographically. One thing I somehow overlooked was the variety of the cuisine. As it turns out, they are indeed a foodie culture! First of all, the region is a veritable fruit and vegetable basket, which helps explain why the food is so delicious. If I had to describe Colombian cuisine in one word, I’d call it hearty. By way of example, around Bogotá’s highlands, a creamy potato soup called ajiaco is popular—made with chicken, various types of potatoes, cream, avocado, rice, and a corn on the cob stuck in for good measure. Take a food tour of Medellín and you might find such city staples as red kidney beans, avocado, fried egg, rice, ground beef, fried plantain, pork sausages and a corn pastry called arepa. 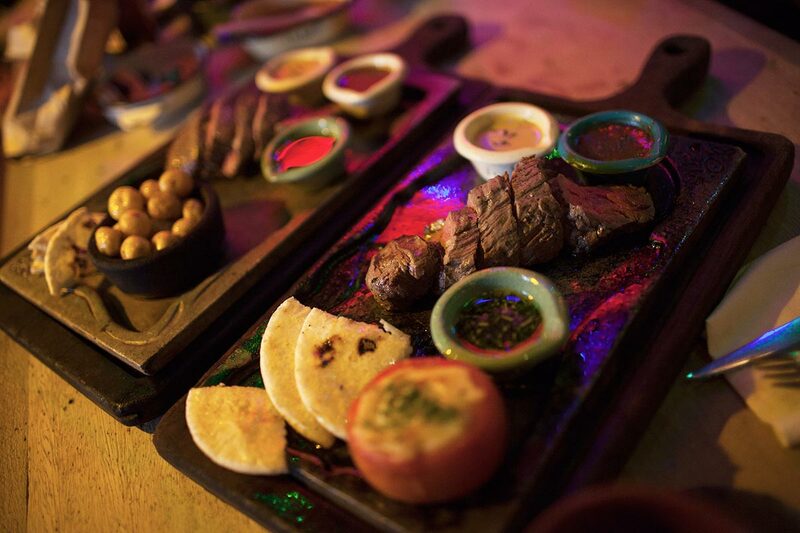 On Team Outpost’s travels, we had the chance to visit the famed Andres Carne de Res restaurant in the town of Chia. Beyond the surreal interior design (and even the surreal size: 11 dining areas and five kitchens to keep 3,000 patrons fed), the assortment of meats presented to us would fulfill almost every carnivore’s food fantasies. Colombia, like much of South America, is big on carne, and while the needs of vegetarians aren’t always uppermost, it isn’t all doom and gloom for the non-meat eaters. In most places, we were able to order yucca, potato, patacones (fried green plantains), rice, eggs and bread, along with cheese empanadas. Vegetarians could also gorge themselves on fresh papayas, strawberries, mangoes, passion fruit, and any other fruit and vegetable imaginable. 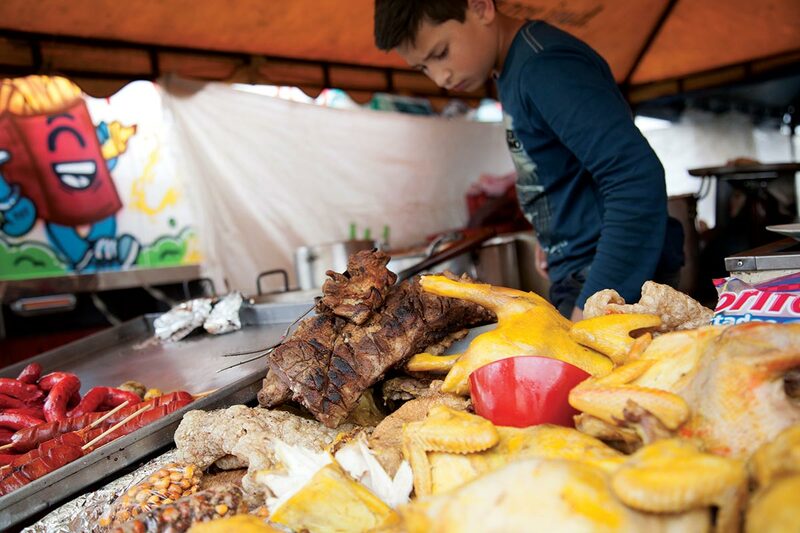 Colombia’s food culture is on every corner. Along the Caribbean Coast, dishes take on a spicier note, with fish, lobster and coconut rice being common fare. Of course, where there is a coast, be it Pacific or Caribbean, there is also ceviche: raw octopus, shrimp, and fish “cooked” in citrus juice. Food variety isn’t limited to Spanish, Indigenous or Caribbean styles, either (or the fusion of all three, as is so often the case in Colombia). A wave of immigration from the Middle East began in the late 19th century, and with it naturally came culinary influences. Ah, the beauty of the global diaspora! All this food talk is suddenly making me thirsty. On the drink menu, Colombia covers the gamut, including hot chocolate made with local cacao (and sometimes with a piece of cheese tossed in! ), iced shakes made with milk or water and fresh fruit, and one of my favourites, agua de coco (fresh coconut water), which I frequently bought from street vendors in Cartagena to rehydrate after a day in the sun. Colombia is also famous for its aguardiente, a potent sugarcane liquor, which can be made into canelazo (served hot with boiled cinnamon water, raw cane sugar, and lime). 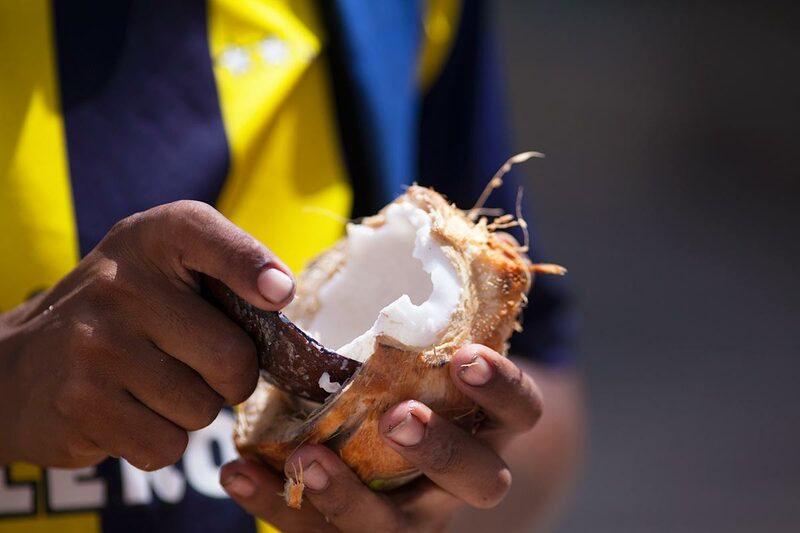 Getting to the meat of the coconut. And yes, I am coming to Colombia’s world-class Arabica coffee, much of which is grown in the Zona Cafetera west of Bogotá. Perfect mid-altitude mountains snuggled just north of the equator make for some spectacular terroir. The coffee growing region is actually fed by the highest peaks in Colombia’s Central Mountain Range. Imagine pristine glacial waters in every cup of coffee. Now that’s worth waking up for.